Held in the spring, 2010. Exhibit curators, Jessica Martindale and Hannah Craddock. The women and men's clothing exhibit included 25 pieces of clothing representing 100 years of Lawrence County Clothing. The corporate sponsors of this exhibit were Walmart and German-American Bank. At left: The brown silk dress was worn by Elizabeth Newland in 1840. This was her wedding dress when she became Mrs. Greenberry Owen. Middle: The plaid green, maroon and black dress was worn by Nancy Caroline Burton Malott. She married Alonzo Malott in 1857. The dress was referred to as her "infair dress" and was worn the day after her wedding to a party given in her honor by her father-in-law, Michael Malott. 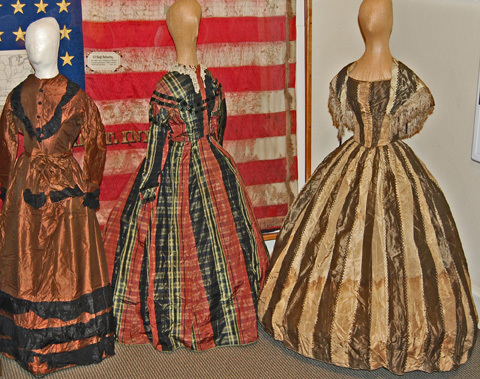 At right: The green striped silk dress is believed to have been worn during the 1860s. The wearer is unknown, but she is likely to have been a wealthy woman. The dress originally had a separate set of long sleeves which tied to the shoulders of the garment and allowed transition from cap sleeves to long sleeves as occasion and weather necessitated.